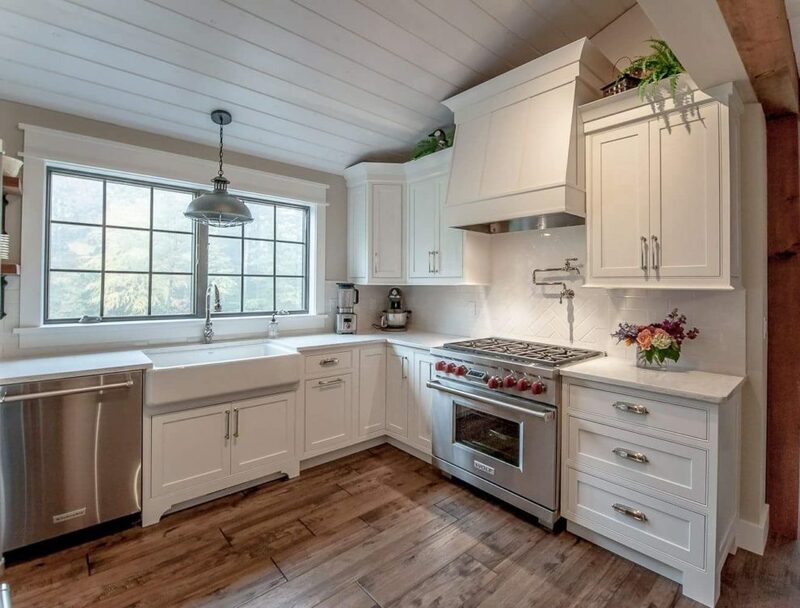 The farmhouse kitchen trend is hot, Hot, HOT. 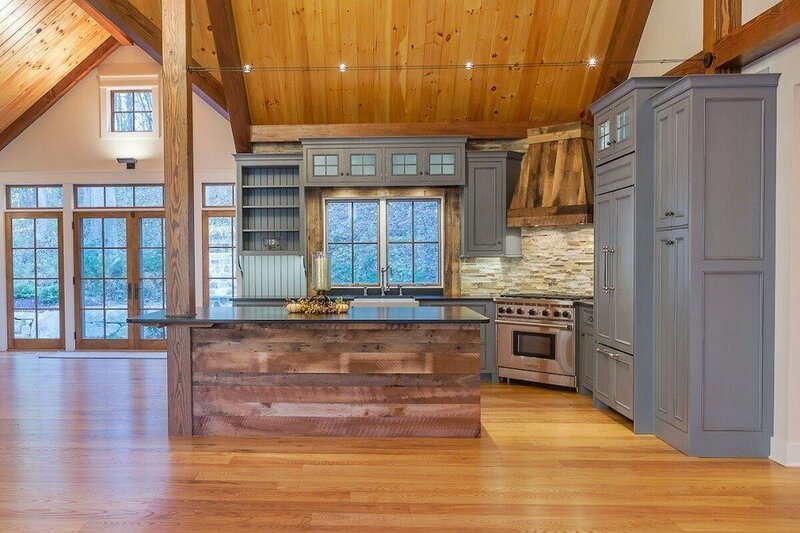 At Yankee Barn Homes, the potential to create the perfect farmhouse kitchen is greatly enhanced due to the gorgeous post and beam frame. 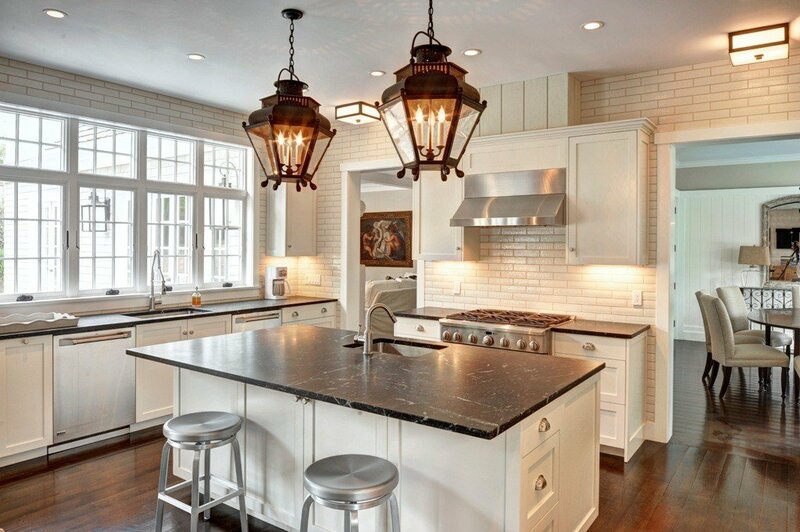 Use our gallery of these 5 hot farmhouse kitchens to inspire your new home’s design. 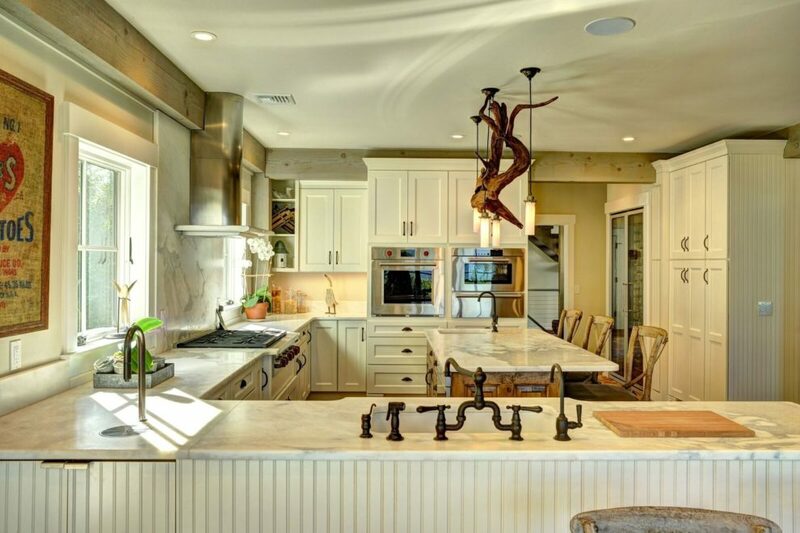 The Cabot: This kitchen is all about space, storage, and user-friendly prep areas. 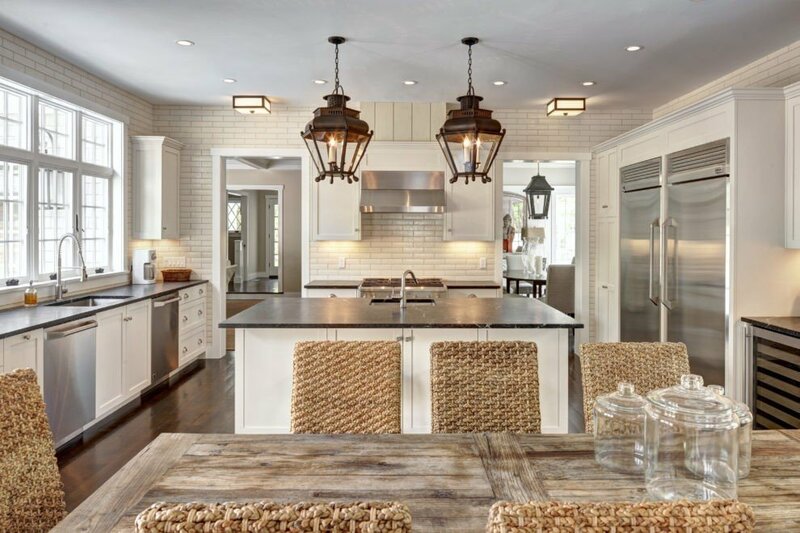 The addition of lantern pendant lights, a rustic hood vent, and a re-purposed sliding door add farmhouse charm. 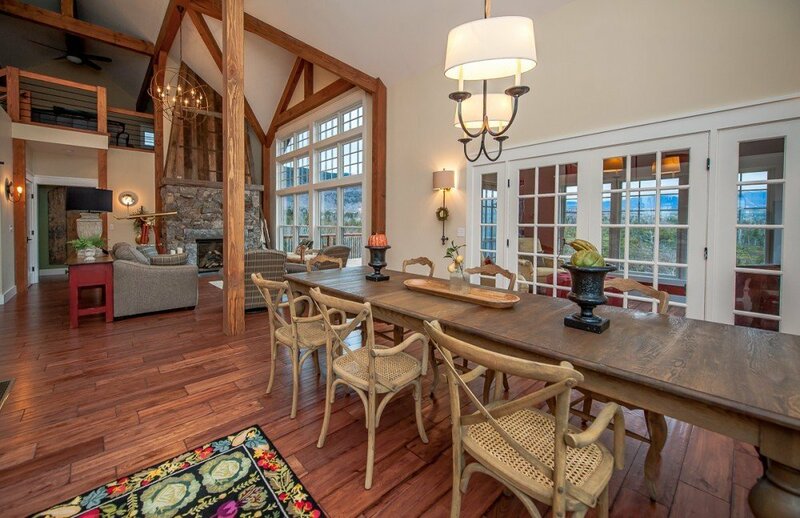 The farmhouse harvest table and provincial cafe chairs carry the style into the dining room. 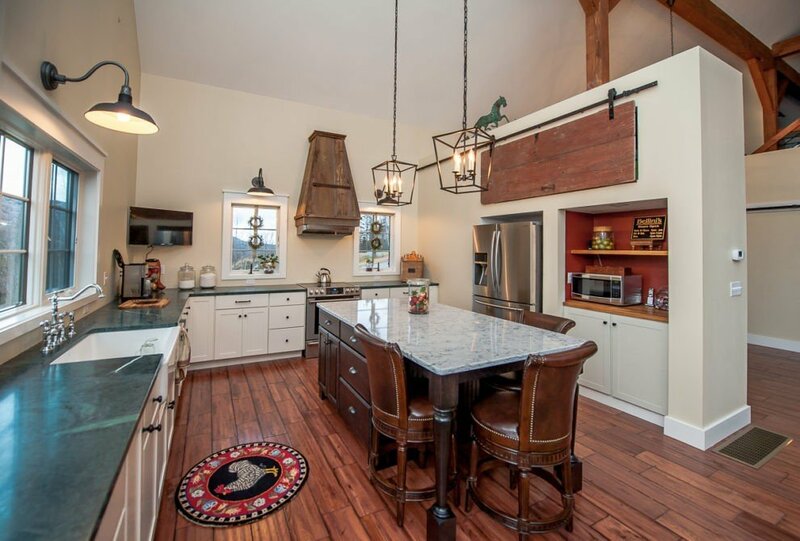 The Downing: An open floor plan for this small barn home with high vaulted ceilings required some serious design skill. The kitchen had to fit the space while not overwhelming the limited square footage. 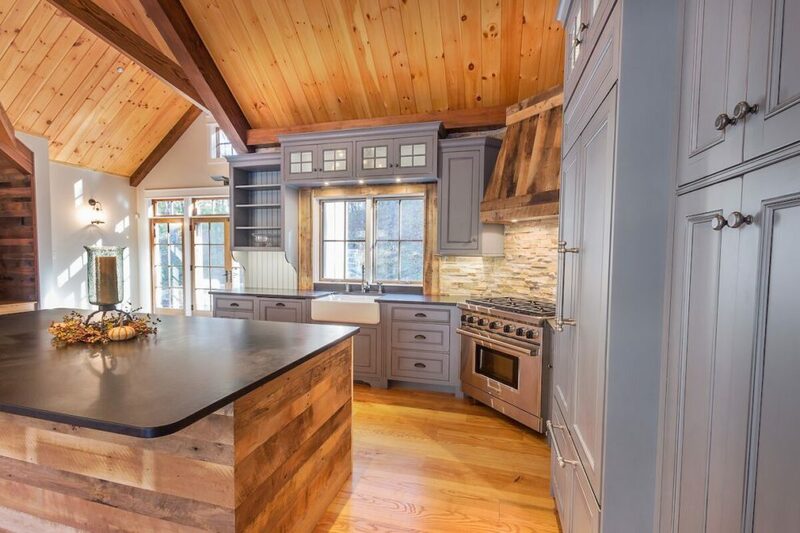 Enter Hazley Builders with their phenomenal design and custom build skills. 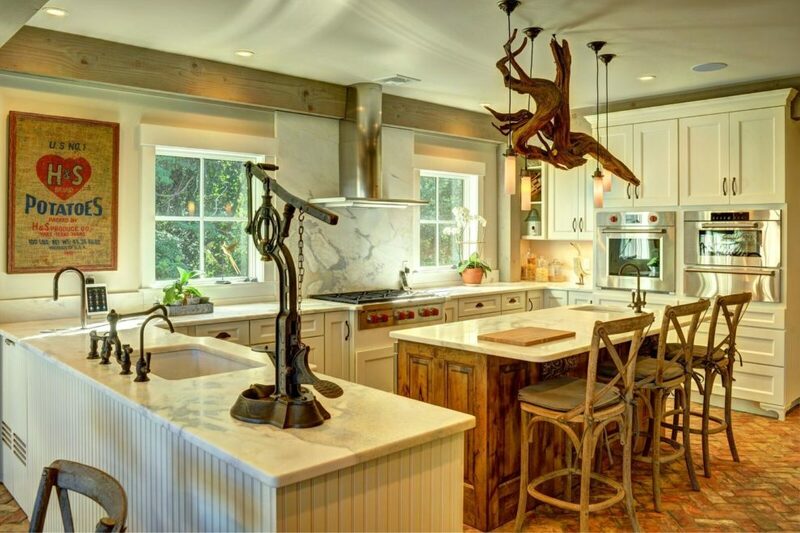 Reclaimed barn board is used for the island, the range hood, and as an accent around the window over the farmer’s sink. 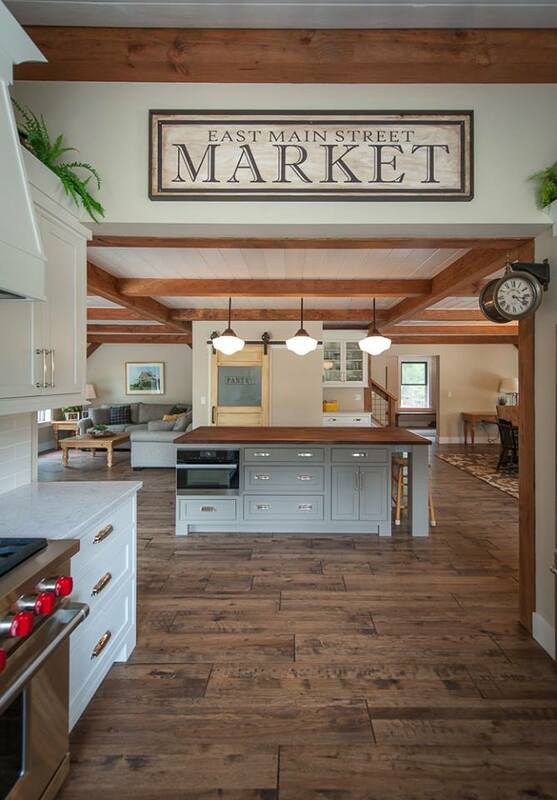 The Main Street Farmhouse: The name of this home says it all. 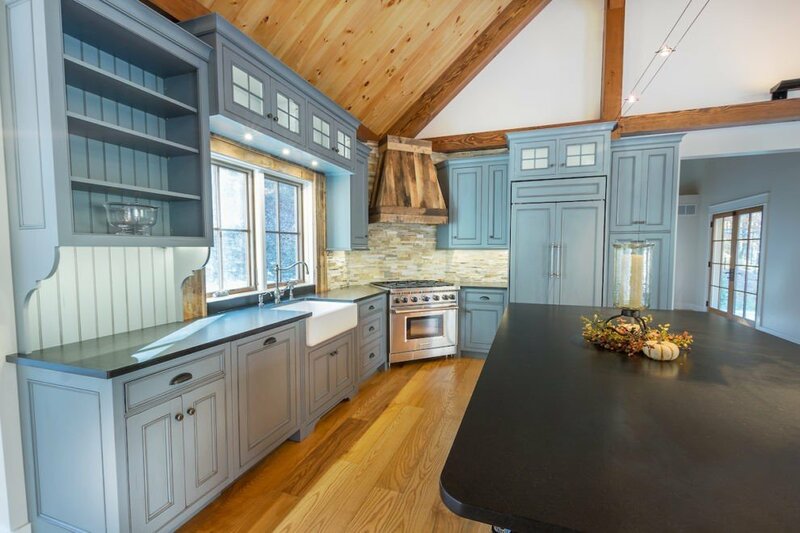 The owners wanted the homey appeal of an old New England farmhouse combined with all of today’s modern technology. The kitchen occupies a shed roof ell and the center section of the first floor. Nickle gap on the ceiling ties the entire open concept first floor living areas together. 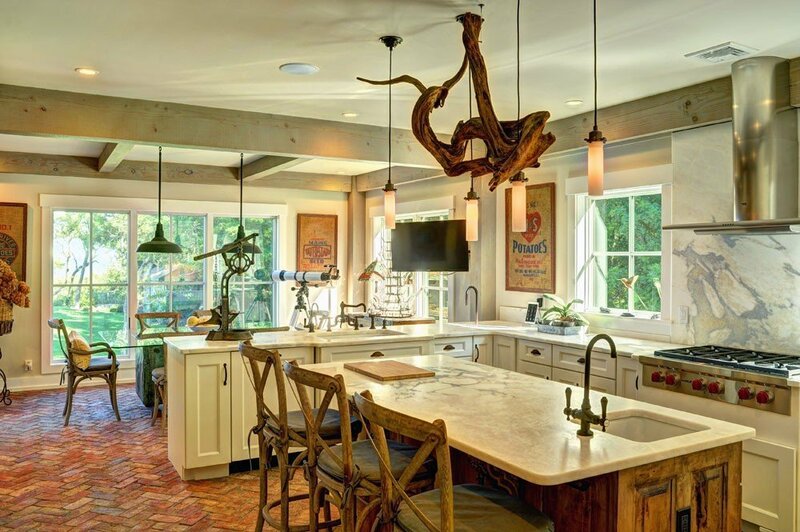 The Southold: While this house is a coastal barn home, the use of brick flooring, rich stain on the reclaimed wood island, and vintage farm ads in rustic wood frames create a kitchen that has farmhouse written all over it. 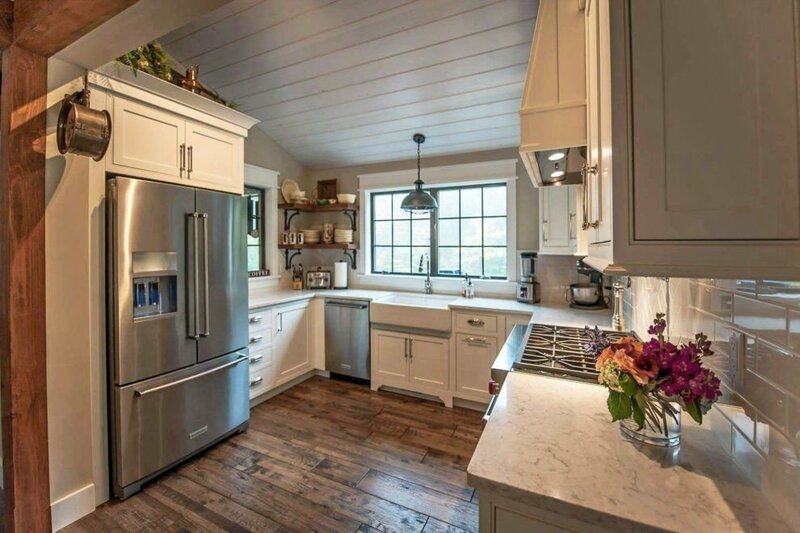 Cove Hollow: This kitchen might not scream authentic farmhouse style, however upon closer inspection you’ll find nods to the farmhouse kitchen throughout the room. 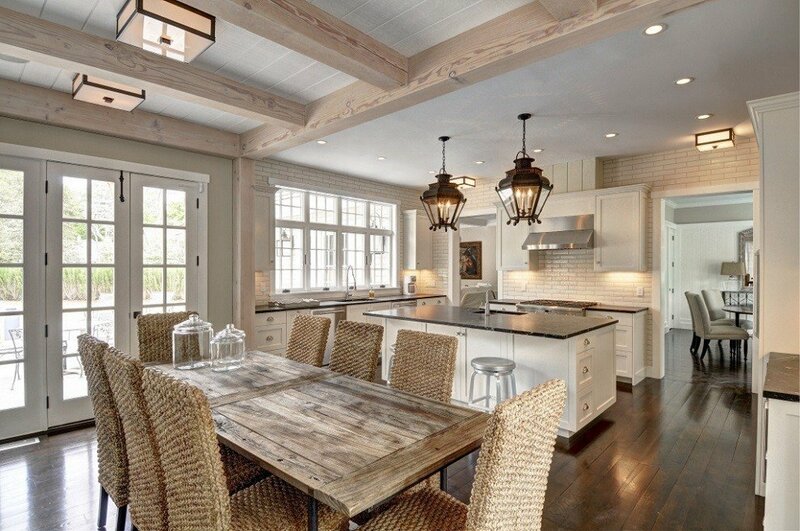 Authentic antique lanterns over the center island, the white washed post and beam frame, and weathered farmhouse table all lend warmth and charm to this spacious kitchen.